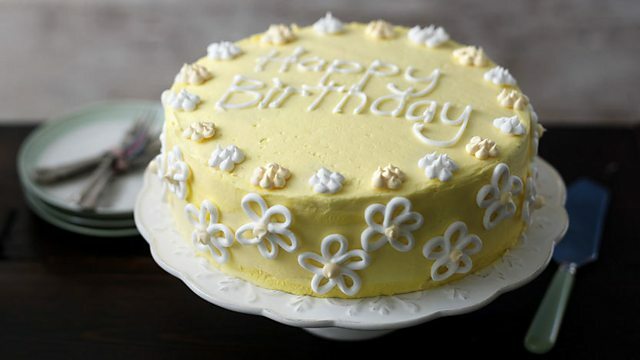 Dan Lepard shows you how to ice a cake with buttercream for a professional finish. The first layer of buttercream is called a ‘crumb coat’. This is applied to seal in any crumbs and to help smooth the surface of the cake. The second layer is then applied for a smooth finish. -Dollop a large spoonful of buttercream onto the cake and then smooth it over the top of the cake to create a flat surface. Using a ruler, slowly scrape the surface to make sure it is smooth and flat. -Spread the icing around the sides of the cake and use a cake scraper or palette knife to make sure it is smooth. -Chill in the fridge for two hours; then repeat with another layer of icing. Chill in the fridge for another two hours.